Residential Landscaping Jacksonville: Make Your Yard Gorgeous In 2018! The New Year is right around the corner. It seems like just yesterday we were ringing in 2017, and now another year has flown by right before our eyes. Did you do any updates to your yard? If you’re like most people, the thought of hiring a landscaper crosses your mind from time to time, but you haven’t yet made the commitment. So what is holding you back? 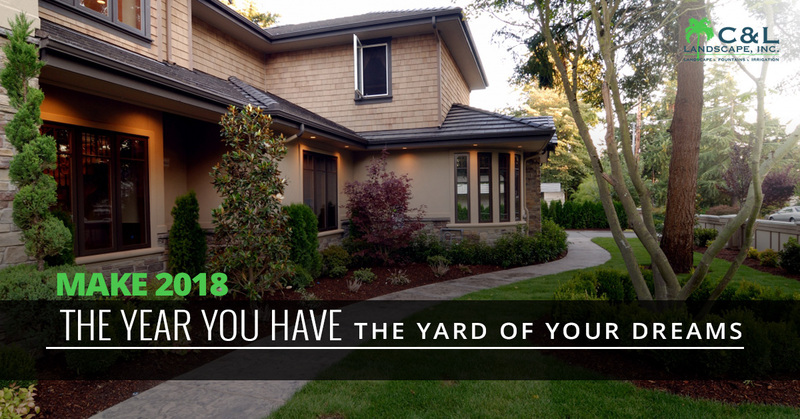 Take a few minutes to discover three important reasons to make the decision now that 2018 will be the year you finally have the backyard of your dreams. But first, be sure to get in touch with C&L Landscape, your Jacksonville landscaping and patio design experts, for a free consultation. Like we said above, this year, like the years before, seems to be over before it even started. This can cause a sinking feeling, especially for those of us with kids growing up right before our eyes. Let 2018 be the year that you create a backyard landscape design that welcomes people in and makes them want to be there. Spend more time at home together. And this doesn’t mean in separate rooms of the house. If Mom is in the living room, Dad is in the kitchen, and the kids are in their bedrooms, you might as well be a world apart. Instead, focus on building features that encourage everyone to hang out together. Whether that means installing an outdoor kitchen, creating a patio with a backyard fire pit, or even clearing out some space for a hot tub or pool, when you have a place you’ll all love to be, you are more likely to spend time together. Perhaps you are thinking about moving soon. Maybe not this year or even the next, but you’ve got that lingering feeling of, “Eventually, I’d like to move to a new home.” When selling your home, first impressions are everything. Now is a great time to invest in updated landscaping. As your residential landscaping, we can do everything from laying sod or brick pavers to building custom pergolas or retaining walls. We can even install sprinkler systems and do regular lawn maintenance. And if you’re thinking this can wait until you’re ready to sell, imagine the return on investment if you plant a couple of fruit trees now that will be mature in a few years. This not only increases the value of your home and draws in potential buyers, but it will also create a space you’re happy to come home to until you’re ready to sell. What does your backyard look like right now? Many people have backyards simply consisting of some grass and a fence. That’s fine for some. But don’t you just want something different? What if you created a cobblestone walkway that led to a beautiful white pergola covered in vines and surrounded by cottage-type scenery and shrubbery? What if you had a full outdoor kitchen with running water, a propane grill, granite countertops and a bumpin’ speaker system that would take backyard barbecues to the next level? What if you finally tore down your old, ugly screened-in patio and built a brand new one that looked good and actually kept the mosquitos out? Or maybe you finally are taking the next step to rebuild your backyard after the last hurricane. Whatever you’re doing, make 2018 the year that you take a risk and just go fo it! With a trusted residential Jacksonville landscaping company like C&L on your side, you know you’ll love the results. From front yard landscaping to increase curb appeal to creating a backyard oasis that encourages the family to spend time together, C&L Landscape is your Jacksonville landscape company you can count on. As certified contractors, we can build pergolas, patios, fountains, fireplaces, and more, as well as design beautiful greenery to make your yard shine. Get a free consultation today.